If you are a freelance writer or editor, you've probably been asked the question face-to-face, "How much do you charge?" And you've probably had that panicked feeling--the heat rising up to your face, your stomach churning, and maybe even dry mouth--before answering, "Well, that depends." But you don't know exactly what it depends on. What should you say or ask next? The person will often look at you like: if you can't even tell me how much you charge, I'm not trusting you with my precious words or assignment. Then you hurriedly quote a price you may regret later. You've also more than likely opened an e-mail from for a rush job from an editor who can't get a hold of another writer who was supposed to be writing an article for her OR an editing client who had a deadline yesterday. Again they probably wrote a high-pressure e-mail: "I need to know NOW--how much do you charge?" These very scenarios seem to be happening to me more and more often. This is good news, as it means I am getting work; but more than once, I've found myself wondering, Am I charging a fair price for the client AND for my time and expertise? 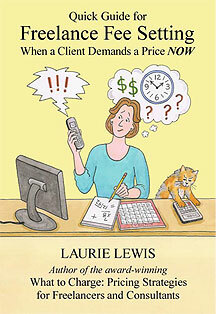 Thankfully, Laurie Lewis, author of What to Charge: Pricing Strategies for Freelancers and Consultants, has written, Freelance Fee Setting: Quick Guide for When a Client Demands a Price NOW. This is a short e-book, from cover to cover only seventeen pages, that allows freelancers to work through a series of questions quickly to set a price for a job. She does not tell you how much to charge, but she leads you through how to make a decision on what to charge quickly and efficiently. Her chapter titles are: "Gathering Information," where she explains you need to take three things into consideration: job details, typical fees, and your gut feelings; "Choosing a Pricing Method," which goes in-depth into the different ways you can charge a client such as hourly or per word; "Determining a Fee and Negotiating Plan," where she describes how to negotiate and determine your bottom line. Her last chapter explains what readers will find in her original and longer pricing book if they want to pursue this topic further. What I love about Laurie's easy-to-read and quick guide is that she thinks of things to consider about pricing a job that I never even thought about before reading. Here are a couple examples: When considering your client, what type of client is this--a non-profit organization struggling to stay afloat for a cause near and dear to your heart or a large corporation with deep pockets? Some may say this doesn't make a difference--you price the same. But realistically, you don't. You may tend to give a lower price to the non-profit because you enjoy the work, and you know they need a break. This leads me to the second example of a point I never really thought to consider before reading Laurie's guide--you really need to take into consideration the psychological aspects of a job. She points out, "If you think you’ll hate the job, you might want to price it on the high side. If you really, REALLY want it, you might want to name a price on the low side of acceptable to be sure you get the job. But don’t price it so low that you’ll be sorry, especially if you’ll be working on it for a long time." Her chapter on the different ways to price is comprehensive, even for a short guide. What she does in this chapter that is so outstanding is describe the pricing method AND then explain the advantages and disadvantages for each method. After reading this chapter, you will see that there is no "one way fits all." You may need to price by the hour for one job; but for another one, a per diem rate may be better. I recommend Freelance Fee Setting: Quick Guide for When a Client Demands a Price NOW for any freelance writer or editor. If you are interested in reading an interview we conducted with the author, please check it out here. Margo is teaching WOW! online classes, and there are still spots open in "Beginning Social Networking for Writers" (starting tomorrow 3/16) and her two NEW advanced classes, "Advanced Writing a Middle-Grade Novel" (starting 4/14) and "Advanced Social Networking for Writers" (starting 4/13). To find out more, go to the classroom here . Sounds like a valuable resource. Great review. Thanks, Holly. It really is and for a cheap price, too. :) I believe it is only $2.99 on Amazon. I also should have mentioned that I feel like it empowers writers and editors to actually charge more than we might usually because we are worried we'll be charging to much. It gives importance to our jobs, in my opinion.